It’s summertime, which means this is the time of year when graduating seniors look at each other and mouth the words: “What now?” To make matters worse, this year’s graduates are tossing off their caps and staring down a uniquely unstable job market. Despite economists’ predictions, long-term unemployment (meaning, being without a job for more than six months) still reaches record-high levels, swelling from 5.1 million to 5.4 million and comprising nearly half of all unemployed Americans. With hope just a flicker of light in the distance, America’s jobless face a second set of challenges. 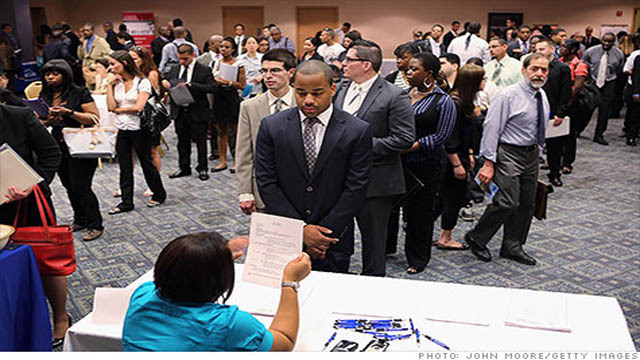 According to a report by CNN, people out of work for more than a year have only a 10 percent chance of landing a job. On a higher note, the report also points out that most people remain optimistic that they will find employment within the next year. But the impacts of unemployment stretch beyond one’s personal finances. CNN Health writer Elizabeth Landau reports that an extended period of joblessness can take a toll on self-worth and mental health. However, the article highlights tips and tactics to stay on track, such as exercising and creating a daily routine setting aside time for submitting resumes, searching for jobs and even eating meals. Unemployment also impacts the family dynamic. CNN Photos has a gallery capturing the life of a family whose father has been facing unemployment for more than a year.